Click on the pictures of the publications to be carried to the web page of the vender. A few of the publications are sold by the Schnabel Music Foundation via amazon.com. 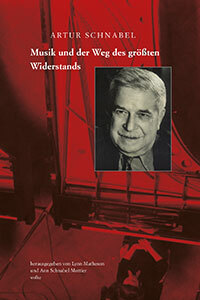 The Schnabel Music Foundation, in cooperation with Wolke Verlag, Hofheim, Germany, is publishing lectures by Artur Schnabel, correspondence between Artur and Therese Schnabel, as well as letters authored by Artur Schnabel. Also presented are all the previous and current Wolke Verlag publications related to Artur and Karl Ulrich Schnabel. 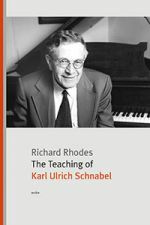 The most recent such book is authored by Richard Rhodes, a longtime student of Karl Ulrich Schnabel. Born in Berlin in 1909, Karl Ulrich Schnabel—son of the pianist Artur Schnabel and the singer Therese Behr—studied with his father as well as with Leonid Kreutzer at the Berlin Hochschule für Musik. He gave his debut in 1926. Apart from his remarkable international solo career, he formed the Schnabel Piano Duo, first with his wife Helen, and later with the Canadian pianist Joan Rowland. 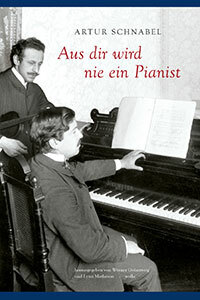 After the war, Karl Ulrich Schnabel became famous as teacher of piano master classes around the world. Leon Fleisher, Claude Frank, Richard Goode and Peter Serkin were among his students. Karl Ulrich Schnabel died in 2001. His archive is held at the Akademie der Künste, Berlin. Schnabel’s “autobiography” can still be read today as a key work of 20th century music history. His dazzling intellect, profound humor and acute insights into music and musical life make his lectures as relevant today as they were at the time. Schnabel was an artist who reflected upon the value of music in modern society like no other practicing musician, and who foresaw developments decades ago that are only now becoming fully apparent. Artur Schnabel was born in 1882, grew up in Vienna, and studied with Theodor Leschetizky. From 1898 to 1933 he lived in Berlin where his international career as a pianist began. Schnabel’s residence from 1933 to 1938 was at Lake Como, Italy; he emigrated to the United States in 1939. Aside from his legendary recordings of Beethoven, Schubert, Mozart, and Brahms, Schnabel’s legacy comprises a number of remarkable compositions of his own. Music, Wit, and Wisdom is also available as a Kindle e-book. A review of the Kindle edition: (from Amazon customer) I bought this because of the many very positive reviews. Which I endorse wholeheartedly. Schnabel was a great artist. Regardless of his “sloppy” playing at times. His were the first “modern” readings, and well studied and understood readings of Beethoven’s sonatas. These “talks” he gave in Chicago, at the University, show more than he might have meant to. This version has been edited, and re-edited, over time. And Schnabel clearly meant to be guarded in what he said. But what comes through is a combination of memories of the pre war Vienna and that entire war time experience, first hand, as well as some hints of what it was like to be in America during the notorious House Un-American Activities era…. So: just as a historical document it is worth the time to read. But more than that Schnabel comes through with the mannerisms and rhetorical style of his times as a truly astute man with a justifiably “strong’ opinion of himself as a great artist. Polite modesty notwithstanding. 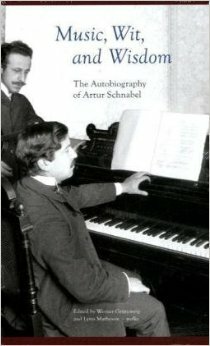 Die zwölf Vorlesungen, die Artur Schnabel 1945 an der University of Chicago hielt, gelten gemeinhin als seine Autobiografie. Die Neuausgabe des in deutscher Sprache erst 1991 erschienenen Buches ist eine komplette Überarbeitung des bisher veröffentlichten Textes, mit teils erheblichen Erweiterungen. Anhand der Vorlesungsmanuskripte, die heute im Musikarchiv der Akademie der Künste, Berlin, liegen, wurde eine Textrevision vorgenommen. Schnabels „Autobiographie“ kann heute noch als ein Schlüsselwerk zur Musikgeschichte des 20. Jahrhunderts gelesen werden. Schnabels blendender Intellekt, sein tiefsinniger Humor, seine scharfsichtigen Einblicke in die Musik und das Musikleben lassen seine Vorlesungen so aktuell wie einst erscheinen. Wie kaum ein anderer Musiker reflektierte Schnabel über den Stellenwert der Musik in der modernen Gesellschaft, und Entwicklungen, die erst jetzt vollständig zur Entfaltung kommen, sah er bereits damals klar vorher. Artur Schnabel, 1882 in Wien geboren, lebte von 1898 bis 1933 in Berlin. Über Italien emigrierte er 1939 in die USA. Schnabels Œuvre umfaßt neben seinen legendären Beethoven-, Schubert-, Mozart- und Brahms-Einspielungen auch viele bedeutende eigene Kompositionen und eine Reihe von inzwischen veröffentlichten Vorträgen. We consider Schnabel’s thinking so current in its relevance that it is necessary for all his writings to be made accessible to the public. This book, with the programmatic title Music and the Line of Most Resistance, marks the first step. The title represents Schnabel’s conviction that the realization of truly great works demands that we not only overcome, but even actively seek out difficulties. To him, the highest form of music is even characterized by the fact that it can never be performed truly adequately, that every interpretation is merely the approximation of an unattainable ideal. This amounts to nothing less than an explanation of why generations of musicians keep interpreting the same pieces again and again: with the true masterpieces of music, this is a never-ending process. No one before Schnabel had formulated this so succinctly; in his lectures, he sometimes succeeded in condensing an entire philosophy of art into a single aphorism. This new publication of Schnabel’s writings now offers a younger generation an opportunity to engage in depth with an artist who reflected upon the value of music in modern society like no other practicing musician, and who foresaw clearly developments that are only now becoming fully apparent decades ago. Music and the Line of Most Resistance is also available as a Kindle e-book. Schnabels Denken erscheint uns heute als so aktuell, daß es nötig ist, alle seine Schriften zugänglich zu machen. Den Beginn macht das Buch mit dem programmatischen Titel Musik und der Weg des größten Widerstands, das nunmehr erstmals in deutscher Übersetzung vorgelegt wird. Der Titel steht für Schnabels Überzeugung, daß für die Realisierung der wirklich großen Werke nicht nur Schwierigkeiten zu überwinden sind, sondern diese geradezu gesucht werden müssen. Er nimmt es geradezu als eine Definition für die höchste Kategorie von Musik, daß sie niemals wirklich adäquat aufgeführt werden kann, sondern jede Interpretation immer nur eine Annäherung an ein unerreichbares Ideal darstellt, was nichts weniger als die Begründung dafür ist, daß Generationen von Musikern immer wieder dieselben Stücke ausdeuten: Mit den wirklichen Meisterwerken der Musik gelangt man niemals an ein Ende. Niemand hat das vor ihm so treffend formuliert wie er, der in seinen Vorträgen es mitunter zustande brachte, eine ganze Kunstphilosophie zu einem einzigen Aphorismus zu verdichten. Durch die Neuveröffentlichung von Schnabels Schriften wird nun eine junge Generation die Möglichkeit haben, sich mit einem Künstler umfassend zu beschäftigen, der wie kaum ein anderer ausübender Musiker über den Stellenwert der Musik in der modernen Gesellschaft reflektierte und Entwicklungen, die erst heute vollständig zur Entfaltung gekommen sind, schon vor Jahrzehnten klar vorhersah. 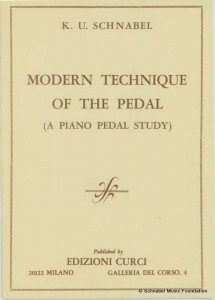 From the Author’s introduction: Pianists have received manifold advice, in books, lectures and lessons, on ways to improve their technique. However, nearly all of this advice refers to the use of the keys; little has been written, said or taught about the use of the pedal. So little, that indeed many pianists do not even realize how they use the pedal themselves. A few rules, sometimes more harmful than helpful, are known to them; the rest is guesswork, instinct, good – or bad – luck. Even some of the great artists developed their pedal-technique relying upon their ears alone, and certainly, the ear should always be the final judge. But while we can and should learn, by listening, which effects are preferable and whether the desired effects are realized or not, the ear alone can not teach us specific methods and means by which these effects are obtained. Produced for the Academy of Arts, Berlin, edited by Werner Grünzweig. Texts and essays by Claudio Arrau, Carl Flesch, Claude Frank, David Goldberger, Harris Goldsmith, William Glock, Ernst Krenek, Hugo Leichtentritt, Theodor Leschetizky. Ausgewählte Schriften, Reden und Briefe von Artur Schnabel. Descriptions of exhibit content, data pertaining to the biography of Artur Schnabel, list of works, bibliography. Beschreibung der Ausstellungsexponate. Daten zur Biographie, Werkverzeichnis, Bibliographie. 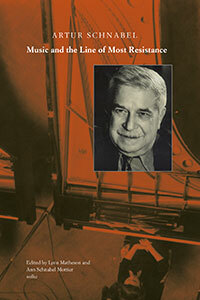 Book of programs encompassing the concert series during the 2001 exhibition in Berlin: Artur Schnabel, Musiker, Musician. The fifteen concerts illustrating the exhibition, with extensive comments on the performed works. Archive zur Musik des 20. Jahrhunderts Bd. 6/2. Das Werkverzeichnis stellt die Grundlagen für die wissenschaftliche Auseinandersetzung mit Schnabels Kompositionen bereit und führt neben den Quellen aus dem Nachlaß und den in der Library of Congress in Washington befindlichen Werkautographen zu jedem Werk einen ausführlichen Dokumentationsteil auf. The List of Works is the basis for the scientific examination of Schnabel’s compositions; it lists the sources of the autographs from the Estate of Artur Schnabel and from the Library of Congress in Washington for each work in a detailed chapter of documentation. Archive zur Musik des 20. Jahrhunderts Bd. 6/1. Artur Schnabel wurde am 17. April 1882 in Lipnik im schlesischen Teil Österreichs geboren und wuchs in Wien auf. Von 1891 bis 1897 studierte er bei Theodor Leschetizky Klavier. Sechzehnjährig siedelte er nach Berlin über und begann seine Karriere als Konzertpianist. Ab 1900 veröffentlichten die Verlage Dreililien und Simrock erste Kompositionen von ihm. Um 1914 orientierte er sich unter dem Einfluß Arnold Schönbergs stilistisch neu. Nach seiner Emigration 1933 hielt er sich zunächst in England und Italien auf, bevor er 1939 in die USA einwanderte, deren Staatsbürgerschaft er 1944 erhielt. 1946 kehrte er auf die europäischen Konzertpodien zurück. Er starb am 15. August 1951 in Axenstein in der Schweiz.